Body Mass Index (BMI) and Gynae camp was held here for mothers of students and teachers of Shemrock Foundation School here. 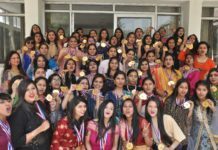 Around 50 mothers and female staff members of the school were examined in the camp, which was organised by Paras Bliss Hospital, Panchkula as a part of Mother’s Day celebrations. Dt. Aashima Chopra, Dietitian with Paras Bliss Hospital, said, healthy women means healthy societies, and they often tend to neglect their health because of household work. Healthy diet is something very important, and the message behind holding this camp was not just to examine them but also make them aware on how to take care of their health. Mrs. Chetan Bansal, School Principal, said, mother plays an important role in a family, and at Shemrock School, womanhood is respected and celebrated always. She added, since Mother’s Day is around the corner, the school this time decided to celebrate it in a different way by holding a camp for them where they got a chance to get themselves examined.